Eliza Shaddad will be performing at this year’s Threshold Festival 2015, Getintothis can exclusively reveal. As well as lending her vocal and writing talents to chart-topping electronic outfit Clean Bandit, Shaddad has made a name for herself by releasing her EP, Waters. The record was produced by Mercury Prize nominated Chris Bond, the talent behind Ben Howard and it has received widespread critical acclaim. Threshold Festival is now in its fifth year and 2015’s action will take place from March 27-29 in the Baltic Triangle. The first acts who will appear at the festival from Liverpool include The Baltic States, Blue Saint and Mersey Wylie. Founded by husband and wife duo Chris and Kaya Herstad Carney in 2011, Threshold has since its inception celebrated the best of grassroots music and the city’s arts scene. Over the years, the festival has attracted a diverse range of people from the creative industry and beyond including musicians, artists and academics, who have come to the event in a bid to discover something fresh and exciting. The festival has grown in popularity year after year. Musically, Threshold has featured the likes of Etches, the Moats and Esco Williams who headlined the festival back in 2013. The 2014 edition included The Destroyers, Natalie McCool and Dub Mafia – check out our reviews of the event and a picture gallery. By the looks of things, these acts are going to make 2015’s festival a real treat. 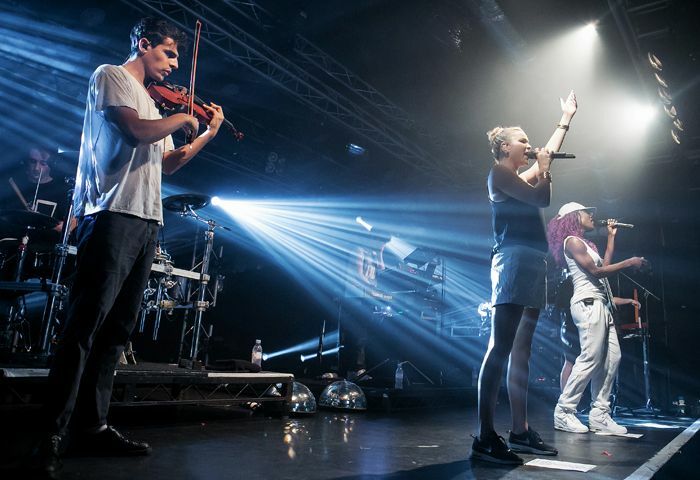 Eliza Shaddad has worked with Clean Bandit and has supported Rudimental and Alt- J on tour with them, as well as warming up for the likes of Michael Chapman as a solo artist. Liverpool five-piece The Baltic States have been making waves since the release of their debut EP Boxes with their electronica and techno sound. Kids On Bridges have been making an impression since releasing their debut album Kidology. Musically, the band have been compared to the likes of Daft Punk and Depeche Mode. Felix Hagan & The Family are a seven- piece band who will be bringing live performances full of magic, madness and pomp. Mutant Vinyl (aka Edwin Pope) has recieved the seal of approval from Radio 1’s Huw Stephens, Paul McCartney and Fun Lovin’ Criminals. Blue Saint is the winner of Merseyrail Soundstation 2014. His alternative rap sound earned him the accolade and he has been going from strength to strength ever since. Dominic Dunn is a 17- year-old who is getting noticed with the help of a guitar and innovative songs which pack a punch. Mersey Wylie is the Liverpool- based, English/Australian singer-songwriter who has been turning heads with her ability to write powerful and emotive songs. Elevant are the band who will be treating us to a sound which blends different types of music including pyschedelia, grunge and blues. The 11- piece band Helena Johnson will be performing a homemade blend of pop, soul and RnB. The Soul Rays are a ten-piece band who will be mixing classic soul and motown with funky modern grooves.